Aphids tend to be a problem for most gardebers. 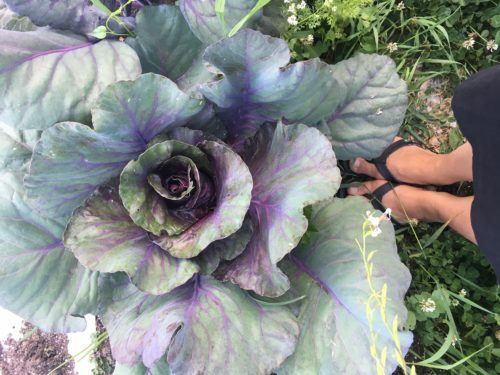 They like the Brassica family (broccoli, cauliflower, cabbage, collard, turnips, rutabagas and the all mighty kale). 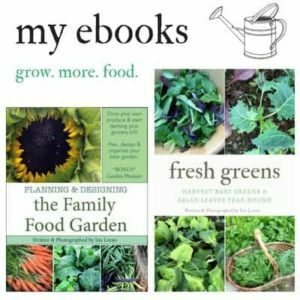 The kale and the broccoli tend to get hit the most, and it can really spoil your appetite as your about to wash your veggies and it’s chock full of tiny bugs that you can’t seem to ever get out! Not to mention the little aphids, the wingless spawn of the odd winged aphid, feed by sucking sap from plants which can damage large amounts of crops in a short time as they reproduce rapidly. A single aphid can produce 600 billion descendants in ONE season. AHHHHHHH. To make matters worse ants like to ‘farm’ aphids to keep them alive and eat the sweet nectar they produce. And to top it off they reproduce asexually (Parthenogenis) so that means they reproduce without actually mating. Seems like a lost cause doesn’t it?! For an in-depth look at the aphid life cycle check out this link. What to ladybugs love to eat? Aphids! Spraying water: I’ve tried dislodging them with the hose many times, and to be honest, it never seems to work. 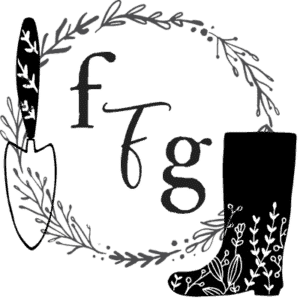 Grow plants with strong scents to deter them: This method uses strong smelling herbs (oregano, chives, sage) and alliums (onions, garlic) to deter the flies from landing on your vegetables and then making aphid babies. Companion planting: Growing plants like Nasturtiums that aphids like next to plants you want to eat to deter them. Use homemade organic sprays: Keep in mind that sometimes they also get rid of beneficial insects and you have to keep applying them. Ladybugs! 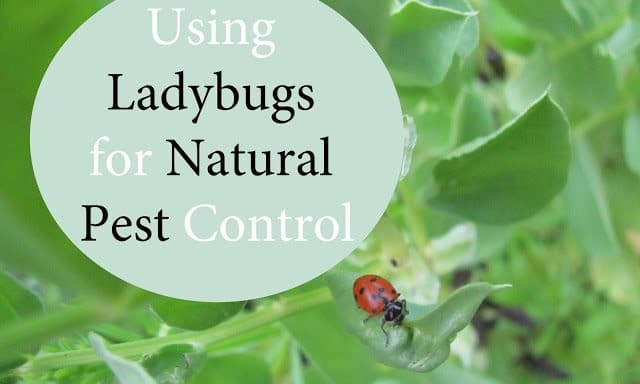 This method is a form of natural pest control by attracting beneficial insects that eat the pests you are trying to get rid of. In this case ladybugs to eat the aphids. 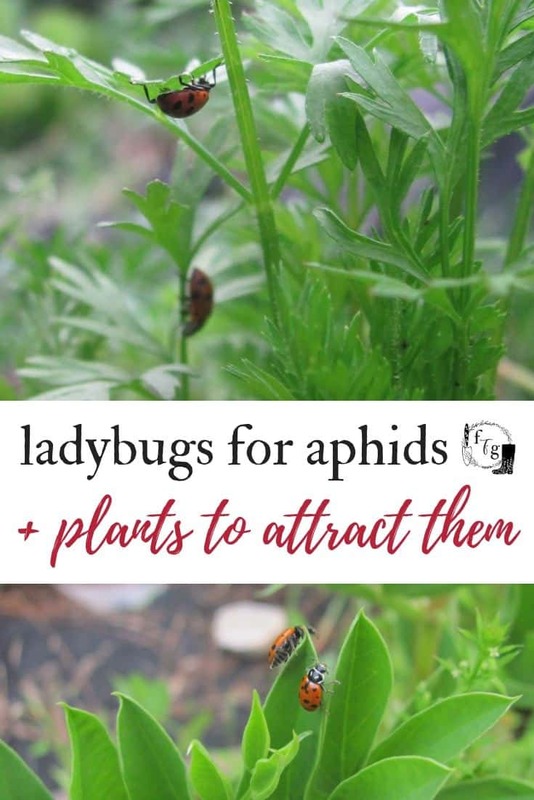 Why use Ladybugs for aphids? Ladybugs are capable of consuming up to 50 to 60 aphids per day but will also eat a variety of other insects and larvae including scales, mealy bugs, leaf hoppers, mites, and various types of soft-bodied insects. Both the adults and larvae are predators, and aphids are their favourite food! If you want in-depth information on the ladybug life cycle check out this link. Ladybugs are drawn to the frilly leaves of plants. 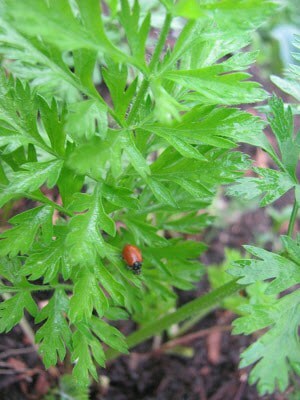 I like to grow carrots around the brassicas, which not only attracts ladybugs but makes for great companion planting. 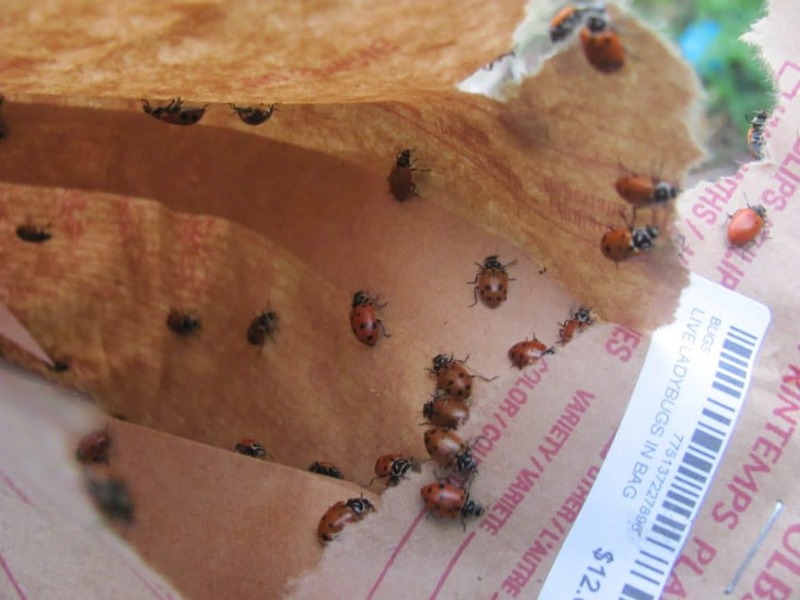 You can also buy store bought ladybugs to release into your garden. I ended up picking some up from DIG Garden Centre because despite trying to attract ladybugs, there was just not enough for good pest control. It’s best to wait until evening to release your ladybugs. This is because if they don’t like their new home they will fly away. In the evening they need to settle down in a place for the night so you have a better chance of them staying. Ladybugs will need some water right away. If it hasn’t rained mist the areas where you are releasing your ladybugs with water. I gently scattered them about the garden close to areas with high aphid infestations and close to lots of frilly leaves. It was an enjoyable evening watching the little ladybugs leave the bag and venture into the natural world. Some crawled up my hands, and after watching them for over half an hour while they adapt to their new surroundings I kept thinking they were crawling all over me! 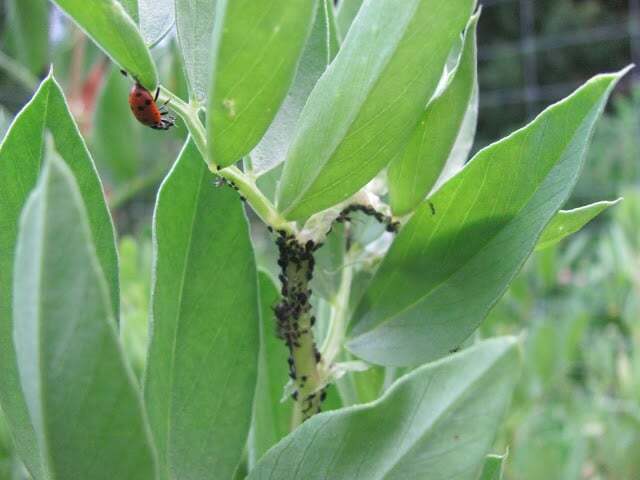 I placed a lot of the ladybugs near the favas which are being covered in black aphids. 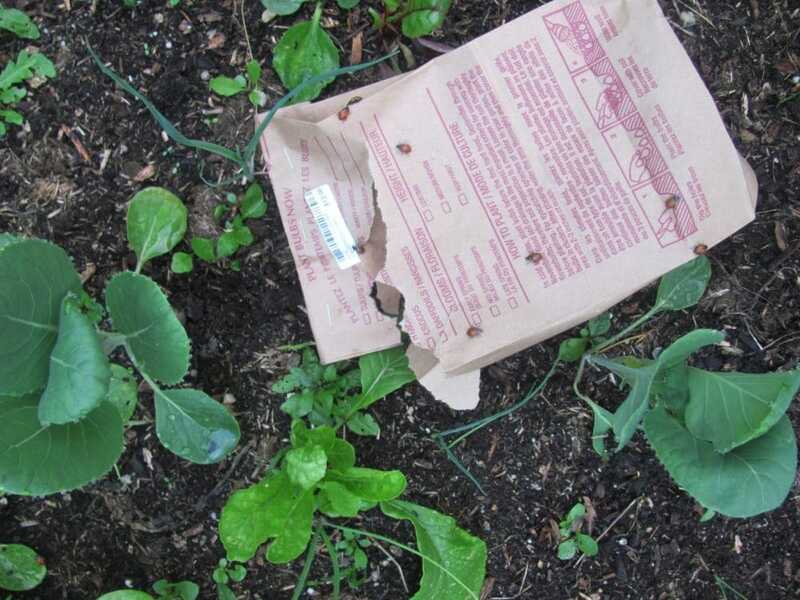 Placing them close to your brassicas, lettuce and roses helps because that tends to be where aphids are. 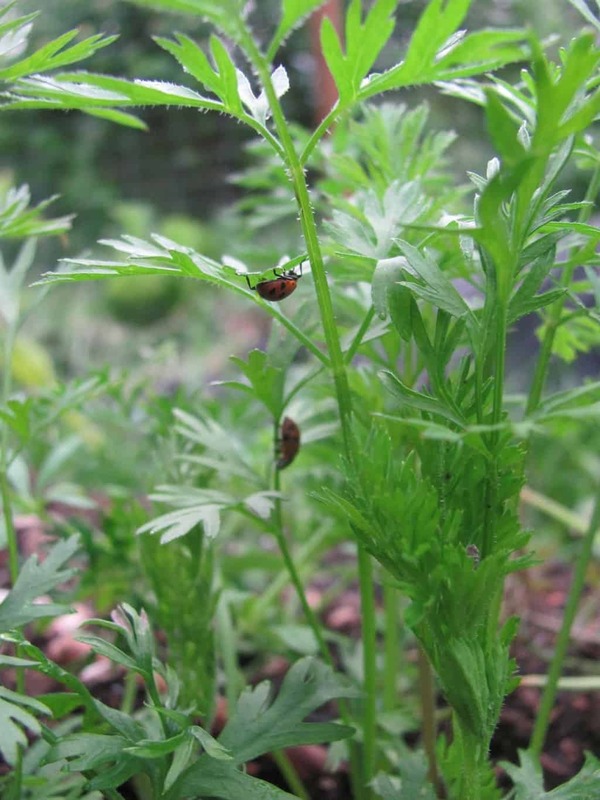 Have you used ladybugs for aphids in your garden?